TiVo has announced the addition of hundreds of new free Web videos available directly to TiVo Series3, TiVo HD and TiVo HD XL subscribers. In addition to these new channels, any video podcast provider can now publish video content to TiVo DVRs using industry-standard Really Simple Syndication (RSS) and H.264 video. Hundreds of new podcast channels are being added to TiVo’s current suite of free Web videos, from mainstream outlets such as CBS, FOX, Oprah, G4 and more. TiVo users can watch any video instantly, or set a Season Pass recording and have new videos downloaded automatically to their TiVo Now Playing List as they are published. 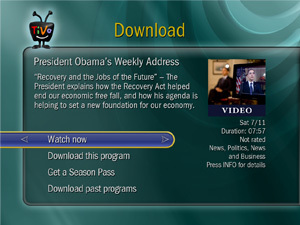 Users also have the ability to stream content not listed by TiVo by simply entering the URL for a video podcast they want within the “Video On Demand” menu on their TiVo DVR. All TiVo podcast channels and episodes are also indexed in TiVo Search. If you’re a video podcaster, add your podcast to TiVo’s directory here.